Ruby F. Ruphard, 103, a resident of Broughton, Illinois, passed away Monday, Jan. 29, 2018 at the Hamilton Memorial Rehabilitation and Healthcare Center. She was born in Hamilton County, Ill. on Nov. 24, 1914 to Charles and Deliah (McThompson) Kennedy. Ruby married William L. “Joe” Ruphard on December 24, 1933 and he preceded her in death. A home maker in life she was also the oldest living member of the former Broughton Baptist Church. Ruby is survived by four sons, Joe Dale Ruphard of McLeansboro, IL, Charles Ronald (Anna Lee) Ruphard of Florida, Lewis Donald (Carol) Ruphard of Whittington, IL, Larry Robert (Joyce) Ruphard of Vine Grove, KY; and one daughter, Joan Lauderback of Tuscola, IL. Thirteen grandchildren, twenty-six great grandchildren and several great-great grandchildren also survive. She was preceded in death by her parents, husband, brothers Henry and Clarence Kennedy and sisters, Kate and Minnie. Funeral services will be held Friday, February 2, 2018 at 10:00 a.m. at the Gholson Funeral Home in McLeansboro with the Rev. Robert Sefried officiating. Visitation will be held Thursday, February 1, 2018 from 6 to 8 p.m. at the Gholson Funeral Home in McLeansboro. 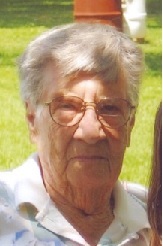 She will be laid to rest in the Gholson Cemetery near Broughton. The Gholson Funeral Home of McLeansboro is in charge of arrangements.